Submitted by JerMann on Mon, 05/16/2011 - 18:51. 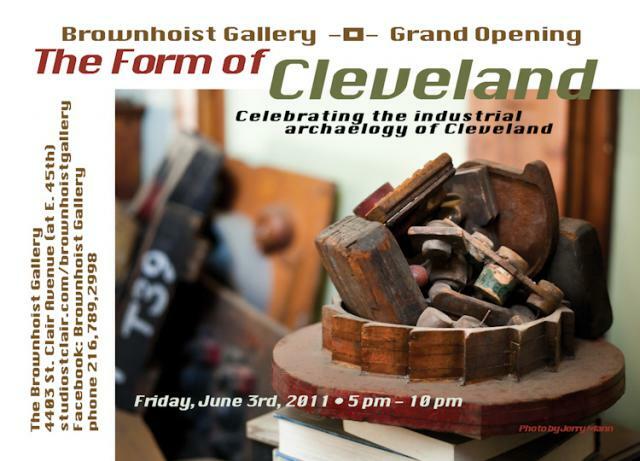 Brownhoist Gallery will open with its inaugural exhibition, "The Form of Cleveland," on Friday evening, June 3rd, at the historic Brownhoist Building in the St. Clair-Superior neighborhood. Sculptor Timothy Riffle and photographer Jerry Mann will exhibit artifacts, carvings and photographs that celebrate the industrial archaeology of Cleveland. The Brownhoist Gallery is located on the 2nd floor of the Brownhoist Building, 4403 St. Clair Avenue, at E. 45th Street. The opening reception for “The Form of Cleveland” will be held from 5 pm - 10 pm on Friday, June 3, 2011. It is free and open to the public. The show will run through Saturday, July 30th. There is plentiful street parking and a fenced parking lot adjacent to the building at E. 45th Street. For more information, contact Timothy Riffle at 216-789-2998, and leave a voicemail if necessary. Or, e-mail Timothy at timothy [at] studiostclair [dot] com . Please look for Brownhoist Gallery on Facebook. One can also view the gallery website at: www.studiostclair.com/brownhoistgallery . Riffle established Brownhoist Gallery after years of operating his business, Studio St. Clair, out of the Brownhoist Building. His collaboration with Mann is a product of their mutual interest in industrial archaeology, which is a core focus of the gallery. In 2000, they salvaged scores of wooden industrial patterns that were being discarded when a nearby factory was shut down. Recognizing the beauty and craftsmanship of the objects, they vowed to mount a show honoring the work and the factory they came from. They also preserved various shop tools, furniture and documents which will also be included in the show. As a complement to the artifacts, the two will also show their personal work. Riffle is known for his wood and stone carvings in both religious and secular venues. In a recent commission, he created a 22-foot high icon shrine at St. Stanislaus Church in Slavic Village. Mann’s photographs are regularly seen in regional publications. He also contributes his artwork, both still and motion picture, to group shows in the city and has also mounted two solo exhibitions. Both live in Cleveland Heights and have been friends since 1994. Their friendship was galvanized around their fight to save the Hulett ore unloaders. Even as that battle was being waged, Riffle noticed the liquidation of the Elwell Parker Electric Company, which was located directly behind the Brownhoist and had been in operation for nearly a century. A dumpster was steadily being filled with the industrial patterns, and he called Mann to assist in saving the least damaged of the pieces. Riffle also paid for pallets-loads of the forms that had not yet been tossed into the dumpster. While in the old factory, they met the last employee of Elwell Parker, assigned to cleanup duty, who sullenly wandered the facility. That experience, along with witnessing the trashing of the testaments of a once-great company, led them to save an under-appreciated aspect of industrial culture. They loaded their vintage pickup trucks with the salvaged objects and took it to the Brownhoist, just across Hamilton Court. There is a significant connection in the Elwell Parker artifacts being exhibited at the Brownhoist Gallery: Alexander E. Brown, the Brownhoist’s namesake, was the principal incorporator of the Elwell Parker Company, established in 1893, eight years after his Brown Hoist Company was created. It is conceivable that the blueprints for many of the forms that were saved were drawn-up within the walls of the gallery building. The Brownhoist Gallery is dedicated to showcasing the work of local artisans, emphasizing architectural history, both secular and religious, and industrial archaeology. The Brownhoist Gallery is looking for artists who are inspired by their local environment and their roots, and whose work is founded on the materials, methods and values handed down from one generation to another. For more information, contact Timothy Riffle at 216-789-2998, and leave a voicemail if necessary. Or, e-mail Timothy at timothy [at] studiostclair [dot] com . Please look for Brownhoist Gallery on Facebook. One can also view the gallery website at: http://www.studiostclair.com/brownhoistgallery/ . Submitted by JerMann on Mon, 05/16/2011 - 18:53. Submitted by Norm Roulet on Tue, 05/17/2011 - 01:35. Welcome. I look forward to seeing the show and space. Submitted by JerMann on Tue, 05/17/2011 - 09:09. Submitted by Norm Roulet on Tue, 05/17/2011 - 10:16. Thanks - that was Ed's old Martell glass at the first birthday gathering after his passing, when he and Whiskey Island became one. I've printed this image up to 6 feet wide and it is pretty amazing - some day I'll print it full size... something like 30 feet wide... for my office. Submitted by Norm Roulet on Tue, 05/17/2011 - 14:32. Right at the end of Citizen Hauser Way. Submitted by lmcshane on Mon, 05/16/2011 - 19:27.